For Drawing Day today I decided to do one of the characters from my last novel. His name is Malcolm, and yes, the name was blatantly inspired by "only Malcolm" from Expecting Someone Taller. I'd been wanting to draw him ever since I wrote the story, so here he is. 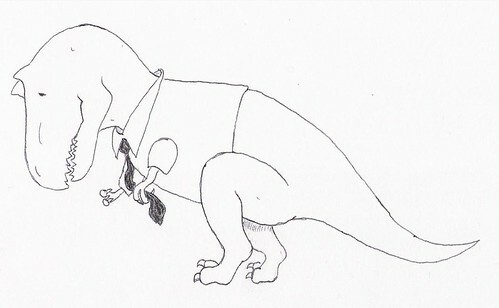 Malcolm is "a very minor and worried demon" who takes the form of a miniature Tyrannosaurus Rex wearing a shirt and tie. He's important to the story, if not to anyone else.